The weekly trips to and from his homeland aren’t the only choppy waters Allan Jenkins has faced in his eventful time at Ballymena United. 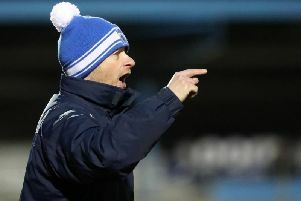 But as the Scottish midfielder embarks upon his sixth season in the Irish League, he is in doubt about the continued improvement in the standard of the Danske Bank Premiership. “The league has definitely got better each season since I came over here,” says Jenkins, who played in Scotland’s top flight with Gretna. “You only have to look at players like Roy Carroll, Sammy Clingan and Paddy McCourt joining Irish League clubs this summer as evidence of how it has improved. “I would say it is very similar in standard to the Championship in Scotland, where teams are capable of beating each other. “Certainly anybody coming over here from England or Scotland thinking they would pick up an easy wage would be in for a shock. “I would say there has been an improvement in the quality of Ballymena’s squads in my time at the club – even if it hasn’t always been reflected in results. “If Ballymena’s best XI went up against any of the other clubs in the league in a one-off situation, we would fancy our chances against anyone – we’ve shown that in cup competitions. “What we have to try to do is do that on a more consistent basis – it’s the extra strength in depth that sets the clubs at the top end of the table apart from the rest. Jenkins believes that the arrival of manager David Jeffrey towards the end of last season can reinvigorate the Sky Blues’ fortunes. “I knew about his achievements at Linfield when I first came over here but even from working with him for a short time at Ballymena, I would say he’s as good as anyone I’ve seen in all my time in the game. “There are so many things to admire about him – how he conducts himself, the way he gest his message across to players and how he gets players to respond to him. “If I was to go into coaching or management, I would probably take more from him than from any other manager I played under.